What is Corey Kluber’s Breaking Ball? Don’t ask Corey Kluber if he throws a curveball or a slider. There’s only one response, and it will be so deadpan it’s almost a whisper on the wind: “Breaking ball.” Maybe it doesn’t matter, but maybe it does. But what is that breaking ball? You’re not going to work Kluber into a corner by asking him what pitch he started with, or if he thinks of it as a slider or a curve, or anything really. He willfully considers it an amorphous breaking pitch. “I don’t care to call it one thing or another. If I start calling it one thing or the other, I think I’d subconsciously try to make it look like I think that should look like it. It’s easier for me to call it a breaking ball and just throw it,” he told me. If you try to classify it by movement, you’ll find it’s perfectly in between the slider and the curve. It drops more than a slider and less than a curve, at least. If you are tempted to call it a slider based on drop, though, consider this. No pitch in baseball has as much horizontal movement. The ones that do? They’re mostly curves. Run comps on the pitch to find the most comparable pitches by movement, like Jeff Sullivan did, and you’ll find that Yu Darvish slider, but also Jose Fernandez‘s curve, Marcus Stroman‘s curve and (sort of) Sonny Gray’s curve. Still… let’s go to the grips. Maybe the grips will tell us something. Top left is Kluber’s grip on his breaking ball. 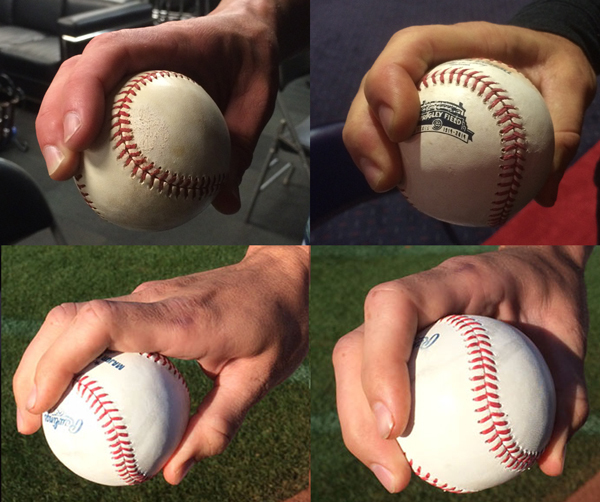 Next to his is Jake Arrieta‘s slider grip, and below the two are Jacob deGrom’s slider (left) and curve (right). There are all sorts of ways to hold a slider, at least in terms of depth into the hand, and you can see that deGrom’s (Warthen) slider is more in the fingers than Arrieta’s slider. But one thing you will find with most slider grips is that the pitcher will place two fingers along the seam. Kluber? That’s a curve grip, with the middle finger doing the heavy lifting on the seam there. Maybe you’re leaning curve right now. Now it’s time to show the way in which Kluber’s breaking ball is most slider like: results. Especially swing and ground-ball rates. If I took the name off his pitch, you’d call it a slider. Without the big old hump associated with your traditional 12-to-6 curveball, maybe batters have less of a warning that something with curve-like horizontal movement is coming. So they swing at a fastball and find air instead. And with ten inches of horizontal movement, you’re past the sort of movement that finds handle or the end of a bat instead of barrel — that’s enough horizontal movement to miss the bat completely. Usually horizontal movement is associated with good grounder rates, and vertical movement with good whiff rates — speaking generally — but there’s something so unique about Kluber’s breaking ball that it’s not surprising that it defies convention here again. After all, we can’t even decide what to call it after rigorous investigation, so good luck trying to the other algorithms and humans trying to classify it. Years of tinkering by Corey Kluber — “Little bit of messing around with stuff — There wasn’t a big moment, I didn’t just grab the ball with my fingers on it” — has produced this excellent breaking ball that is gripped like a curveball, cuts like a curveball, sinks like a slider, and produces outcomes like a slider. “Breaking Ball” is right. We hoped you liked reading What is Corey Kluber’s Breaking Ball? by Eno Sarris! This is a fabulous post. Great content that ESPN can’t touch even on their best days.